A ‘Rich Picture’ is the first stage in the design process. 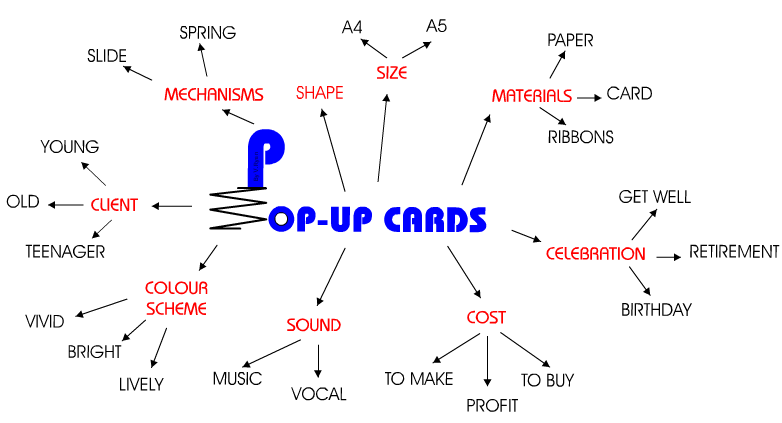 When designing a pop-up card the theme is placed in the centre of the page and words relating to it are placed around it. This approach helps a designer to think about all the aspects of the design problem or brief he/she has to solve. Solving a design problem can be very difficult and so it is important to spend time on this first stage. Often a word placed on a rich picture early in the design process can lead to a solution later in the design process. Below is a basic rich picture which has been drawn for a pop-up card exercise. Examine the way the words are arranged around the theme and the meaning of each word. 1. Draw a rich picture with the theme ‘pop-up cards’ at its centre. Write/draw the main word/theme in an imaginative manner, the rich picture above shows a spring pushing up the first letter (see further examples of styles/graphics for the theme). 2. Add words that relate to the main theme, spacing them carefully on the paper. You may wish to select a style of writing and colour scheme at this stage. Try to add extra words, not only the ones shown in the example. 3. Add pictures or drawings to some of the words. For example, next to cost - a pound or dollar sign could be added. 4. Add a title to the rich picture - use an attractive style of writing with appropriate colour/shade. Below are examples of the way the centre theme could be drawn/designed. This area of the rich picture is the focus of the page, therefore it must be presented very well. Spend time on this piece of work. 1. The first letter pops up as the spring uncoils. How could this be drawn on paper? Click here - how to make pop-up letters / characters. 2. The theme springs out as the card is opened. A small card could be made for the centre theme of the rich picture which could be opened and shut. 3. The word ‘card’ pops up as the spring uncoils. How could this be drawn on paper? 4. The main theme is part of a pop-up card itself. A small card could be made for the centre theme of the rich picture which could be opened and shut. 5. The person behind the main theme is trying it stop the first word from popping up too far. How could this be made to work as a centre theme?